:Ellie Maust, an Old Order Amish girl growing up in the early 1900s, wishes she could wear bright dresses like her English friend, Missy, and face cream and perfume like their fancy Amish hired girl, Susie Glick. As Ellie helps to care for the new babies in her family, milks cows, and learns to can and garden, she strains against her father's strict ideas and wonders what her future will hold. Along the way, she has adventures, including a sleepover at her English friend's house and a runaway buggy ride. When Ellie's family moves to a new farm, she must take on even more chores and responsibility for her younger siblings. But attending Sunday night singings with the young people in her community and beginning a courtship with kind, gentle David Eash fill Ellie's days with contentment. When tragedy strikes her family, Ellie must find a way to go on. 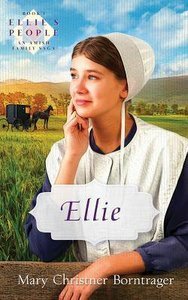 Finding comfort in her Amish faith and her community, Ellie blossoms into a young woman who dedicates her future plans to God. Book 1 of the Ellie's People: An Amish Family Saga series. Ages 10 and up. The ten books of the Ellie's People series, beloved classics among young and old readers in Amish and Mennonite communities, are now available for today's reader. Author Mary Christner Borntrager grew up Amish and based her novels on events in her Amish childhood. Fans of Laura Ingalls Wilder's Little House on the Prairie series will love learning to know spunky Ellie and her friends and family. About "Ellie (#01 in Ellie's People Series)"
Borntrager was one of 10 children born to Amish parents. She attended teacher training institute at Eastern Mennonite College, Harrisonburg, VA. She is an active member of the Hartville Mennonite Church.